As video sharing become fast popular, Sony has launched its new digital camcorder for bloggers and internet video-sharing fans, named as Sony NSC-GC1 Net-Sharing CAM, which allows its users to upload short video clips to the video-sharing websites such as Youtube and Crackle. The Net-Sharing CAM that features an 2.4-inch color LCD display can capture video to Sony Memory Stick DUO in 2 resolutions which are QVGA (320×240) at 15 frames per second and VGA (640×480) at 30 frames per second. Furthermore, this pocket-sized digital camcorder will incorporate a Sharemark button so users can select videos and photos they want to upload via its pre-loaded PMB Portable software. 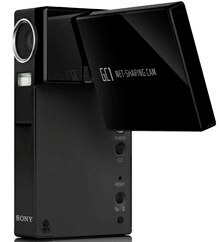 The new Sony Net-Sharing CAM that shoots video in the MPEG-4 recording format will hit the market in coming September for about $200.